If the conversation relates to AA77 the ramifications are obvious. But therein lies the problem; we don't need to know about the conversation because we have ample other evidence to eliminate the possibility that it was AA77. In fact, once you go through all the data, the only logical conclusion you can come to is that this was a ghost track for UA93 on the TSD. I notice the original video linked by CE is no longer active, so for reference here is Mineta's testimony. I was going to save this for the book, but I guess I really need to get some feedback since the "ramifications are obvious". If this has been discussed already and I missed it, then my bad. 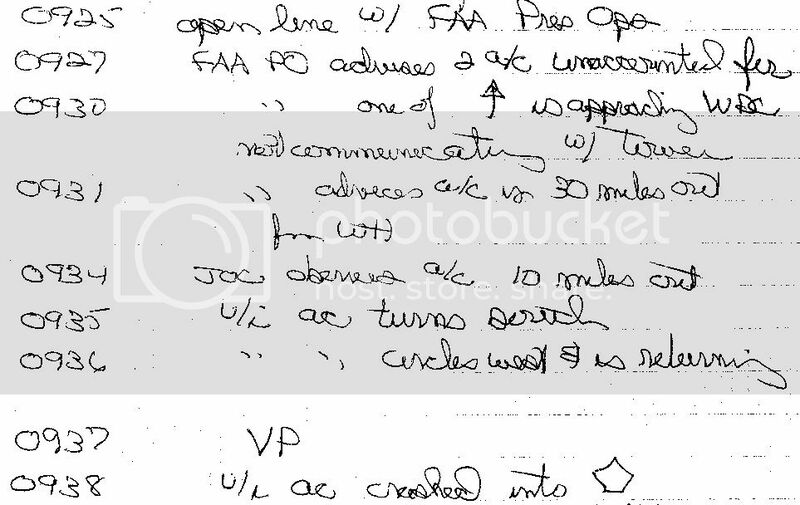 Here are the notes from a Secret Service log done for the 911 Commission and recently released by NARA. I hate to say it, but at first glance this seems to confirm Mineta's account that the plane in question was AAL77. Last edited by BCR; 10th March 2011 at 11:13 AM.